Twenty-eight Years On Air ! ! ! The Space Show is a one hour radio programme presented every Wednesday evening between 7 and 8 p.m. Australian Eastern Time (AEST=UTC+10 hours, AEDT=UTC+11 hours) by Andrew Rennie and other members of the Space Association of Australia for 88.3 Southern FM. 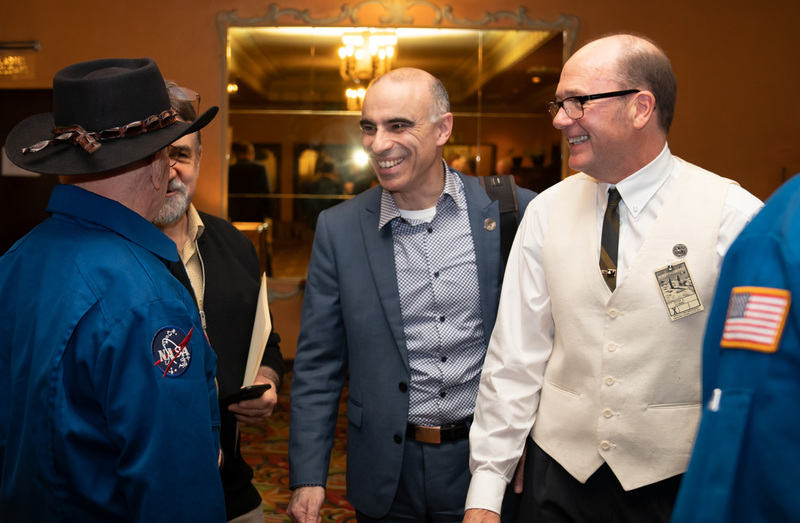 It aims to promote a public understanding of spaceflight and astronomy, and to provide the public and members of the Space Association of Australia with up-to-date news of space related events. To do so it covers a wide range of current space and astronomical events. The Space Show began on 1991 April 7 as a fortnightly half hour programme on Sunday afternoons. Within a few months it had so impressed the station's Programming Committee that it was promoted to one hour per week, and on 1991 November 13 switched to Wednesday evenings. It has never missed a week since. The producer and presenter is Andrew Rennie. Peter Aylward travels international to secure material, while in the past Alan Walker and Simon Winn kept the show on track by twiddling the knobs back in "Mission Control", making the occassional solo foray onto the airwaves, and digitaly transferring material around the world. These days "Jay" does mission control. The Space Show includes: space and astronomy news; interviews; recordings of lectures; the night sky; media alerts or previews; media reviews; historical documentaries; explanations of the science behind the space events and astronomical discoveries; Space Association and community event notices; and ocassionally music. Neeedless to say, most of the material broadcast are exclusive to The Space Show. They will not be heard on any other station because we record most of our own material and also because no other Australian radio station devotes an hour per week to covering space and astronomy. 88.3 Southern FM (a.k.a. 3SCB) broadcasts in stereo on 88.3 MHz on the FM band, using a 250 watt transmitter on the Moorabbin TAFE. Polarisation is vertical. We can be received in most areas of Metropolitan Melbourne provided the listener has an efficient radio receiver with a vertical antenna. N.B. The owner of the radio above will NOT be able to receive well as the antenna is not extended!! During 1995 we moved into new studios. The move resulted in better production facilities being available, allowing a higher standard of programme to reach the listener. During 1998 the studios were equipped with minidisc players, replacing the ageing "cart" machines. We also installed a satellite dish, allowing us to access programming from ComRadSat, the Community radio satellite network, relayed via an Optus satellite. In 2005 we again moved studios, this time to Mentone. A transmitter shift and upgrade was made in the early 2010s. At about this time we also began streaming live on the Internet. In early 2015 we were on the move yet again, to new studios in Brighton. During 2011 and 2012 more than a thousand past programme items were digitised into MPEG 3 format, and loaded onto the Southern FM computer server for public download. New items are added about a week after broadcast. As a general rule entire shows will not be added, with the exception of the few listed below. Few because we don't usually record the programmes and most of the ones that do get recorded are erased within a few days. The eight listed below somehow escaped erasure! 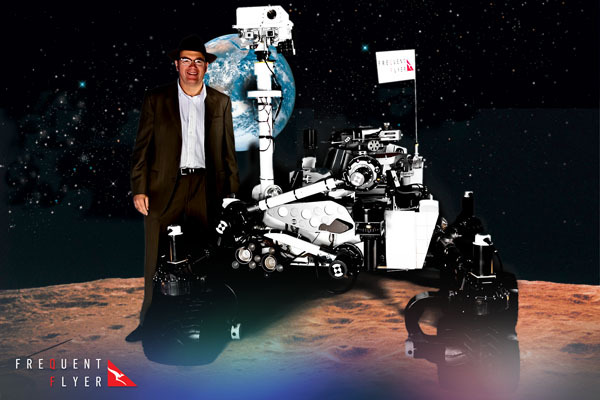 During 1998 The Space Show recorded many events at the International Astronautical Federation Congress in Melbourne. We invite you to take a look at to some of the items we recorded there. In 2010 both Andrew and Peter travelled to the Kennedy Space Center to report on the rundown of the Space Shuttle programme, and the changes President Obama was bringing to the United States Space policy. Andrew's Diary of the month he spent in Florida is posted here. It is liberally illustrated by his own photos. During 2017 the "Three Amigos" (Angelo, Michael and Peter) began filing weekly news reports. In 2019 Tina joined our news team. The Space Show has always had news, which previously was compiled by Andrew Rennie, Richard Tonkin or Alan Walker. For over a decade we ran the daily radio series Earth & Sky on The Space Show. We often use other material supplied by mainly NASA, ESA, STScI and JAXA. Such use is acknowledged in the programme listings below. Listen to our original on-air promotional message, circa. 1991. Sponsorship Opportunity : The Space Show has available up to four minutes an hour of sponsoship. We invite you to contact the radio station to discuss terms.